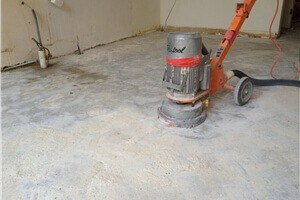 Concrete grinding involves using rotating diamond teeth discs to level, smooth or clean the surface of a concrete slab. All Stripped use this process to remove all types of glues, paints, sealers and waterproofing membranes off concrete slabs. This process is also used to level highs in concrete slabs up to 3mm, grind expansion joints level and prepare surfaces for application of levelling compound. 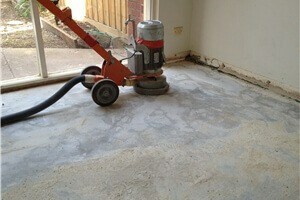 Why do I need concrete grinding? If you are looking to lay any direct stick floor covering to a concrete slab you must first check that the concrete slab is clean and level. Floor coverings such as tiles, vinyl, timber and cork need a clean smooth and porous slab to bond too. Any residue between the concrete and new adhesive will affect the quality and durability of the floor covering. All Stripped are the most professional when it comes to concrete grinding, knowledge of different slab types and the suitable diamonds for grinding them ensure that the process is both very effective and efficient. This, combined with the use of dust sheets and vacuums, ensure that dust is kept to a minimum when grinding indoors. All Stripped maintains a high standard of work with every job left clean, smooth and ready for any application.